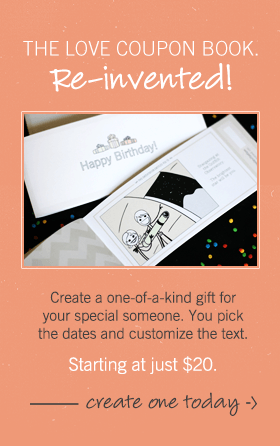 Follow these 4 steps to create a thoughtful (yet affordable) romantic gift that will have your sweetie singing your praises. Green Eyes by Coldplay – Olga and I recently went to a Coldplay concert and we both love the band. I picked Green Eyes though because Olga has the most beautiful green eyes I’ve ever seen so the song makes me think of her whenever I listen to it. Here & Now by Luther Vandross – This one is a bit of an inside joke that I’ll let you guys in on. Olga is the most positive and optimistic person I have ever met. It is one of the qualities I love about her most. She likes to talk about living in the “Here & Now” so when I saw this song title I just had to include it on the CD. Turns out it is an unbelievable love song too by one of the all-time R&B legends. She’s My Kind of Rain by Tim McGraw – I haven’t liked the rain ever since we were forced as kids to do recess indoors when it was raining outside. I picked this song because if I were to like any kind of rain it would be Olga’s kind. Count on Me by Bruno Mars – Olga and I are huge Bruno Mars fans and this is “our song.” Obviously, if you are making a love song music mix, you should include your song. And if you are in a relationship don’t have a song, then get one ASAP. Print out the Song List and add a sweet handwritten note on the space provided (this is why I suggested the “Text Only (Black & White)” theme). Use a scissors to cut out the insert (there are lines indicating where to cut). Fold and put in the CD case. Use a Sharpie to write a To: / From: on the CD itself. 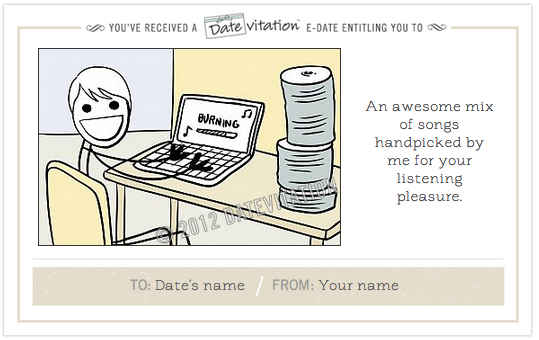 Step 4 – Give her the CD AND explain your selections – This is the best part. You can try to be creative in the delivery by putting it under her pillow or in her laptop case, but I would actually suggest personally delivering it to her. You can wrap it if you’d like, or even just say I made something for you and hand it to her. Why do I suggest giving it to her directly? Because the smile on her face will be twice as big if, when you deliver the CD, you take a few moments to explain why you picked the songs you did. Hey! Thanks so much for this great idea! I absolutely think you explained this awesomely! This may sound stupid, but it also made me more confident the way you spoke. THANKS!